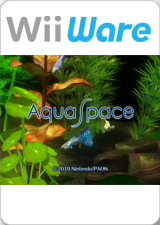 Turn your television into a living virtual aquarium with AquaSpace (Aqua Living: TV de Nagameru Uotachi in Japan). You can simply relax by watching the fish or take the opportunity to read detailed information about them, such as scientific name and habitat, using the illustrated encyclopedia. If you want to get up close and personal with the fish, you can even dive in with a Mii character to swim with them, feed them, or hunt for trivia icons to discover fish-related facts! The graph below charts the compatibility with AquaSpace since Dolphin's 2.0 release, listing revisions only where a compatibility change occurred. This page was last edited on 18 February 2018, at 05:26.